Left the hotel and walk to BART to find there was a disruption due to a “Police Incident ” so trip took twice as long as usual then we walked out the wrong exit at Embarcadero station so the walk to the Ferry Building was longer than usual too. Still to have breakfast we picked up cheese and bacon toasties. They came in a box 5 minutes before boarding the Ferry to Vallejo on the other side of San Francisco Bay. We finished the toasties on the Ferry Rossco said his were nice and he ate every single morsel including the pickles. Mine on the other hand was soooo greasy I didn’t eat it all and used the pickles to allow the grease to drain…… We were on our way to the Nappa Valley wine train. 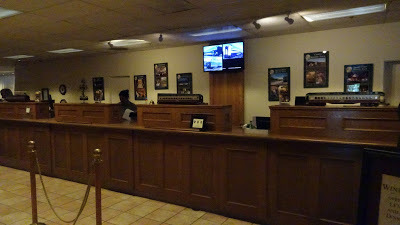 Arrived Napa just after 10 and they were expecting us. The road trip from the ferry terminal to Nappa was a bit rough in places due to the road condition. We were in a California Wine Tour Bus based on a F550 truck chassis. The Nappa Wine Train Terminal was exceptionally good, all staff were very courteous and friendly, we could not find fault with anything and we would recommend it. Video of our train arriving…. The train ride was absolutely great Rossco said he felt like his head was on a swivel! 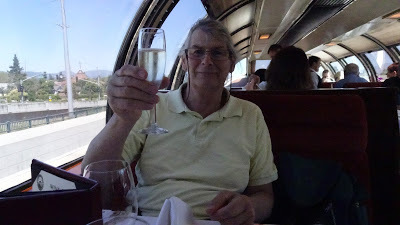 We sat at a private table in the Ex Northern Pacific Pullman Vista Dome coach where we were greeted with a glass of Champagne followed by an amazing meal. After the bread with creamed butter we had a glass of Pine Ridge Chenin Blanc~Voignier Blend, California 2014 on the recommendation of the waiter – it complemented the first course of TRUFFLED RICOTTA RAVIOLI perfectly. I noticed on the wine list a Madrigal Family Winery Zinfandel, Nappa Valley 2013 and enquired of the waiter as to her thoughts, as she was spot on with the previous selection, she immediately poured two tasting glasses for us – it was divine… so a bottle it was and when that ran out we had an extra glass too! The Zinfandel perfectly complemented my Second course of WILD MUSHROOM SOUP which I think is the best mushroom soup I have ever been served. Rossco had the LOLLA ROSSA, BIBB LETTUCE & BLUE CHEESE and he thought the wine went well with that too. Again the wine complemented the ROAST TENDERLOIN OF BEEF & BRAISED SHORT RIB HASH that we both had – It was delicious the meat was so tender it melted in your mouth (even Rossco’s medium rare which was nicely pink). I had previously advised that I could not eat a “sweet desert” this was known by the waiter who offered me the chiefs suggestion of a fruit plate which I accepted. The fruit plate contained Strawberries, Raspberries, Blueberries, Grapes (seedless), fresh Orange, fresh Pineapple and two types of Apple slices. Rossco had the ESPRESSO CHOCOLATE DOME and the grapes…. When we arrived back in Nappa at 2:35 on exit we were introduced to the chief. During discussion he told us he has a US chief mate from Florida who has emigrated to Australia working in Brisbane. That trip was a very nice classy way to spend a few hours. I browsed the souvenir shop at the station and found a bottle of Zinfandel we had on the train and a tee shirt which are now mine along with Rossco’s Cap. We got on the shuttle bus back to the Ferry terminal and after we arrived the Ferry docked about 5 minutes later and after the city crowd disembarked and the safety check completed we were allowed to board. The Ferry departed for San Francisco at 5:45pm. The Bay was a bit choppy so we rocked and rolled our way across. Rossco wanted to take a movie during the crossing but the movement then sea spray on the upper deck windows made it impossible.